There are quite a few benefits of keeping the air ducts in a house clean; not only are you healthier because of breathing fresher air, it is also energy efficient and can prolong the life of your HVAC system. The fact is that every year, the number of people diagnosed with some sort of respiratory problem or allergy is increasing. These problems have a profound impact on one’s life, one can avoid them to some extent by getting the air ducts of your house cleaned. For the people of La Jolla, Superior Cleaning and Restoration Inc. provides unmatched air duct cleaning services, so that you do not have to worry about respiratory problems emanating from dirty air ducts ever again. We are capable of removing and sanitizing every vent by employing a cleaning unit which uses Roto-brush. 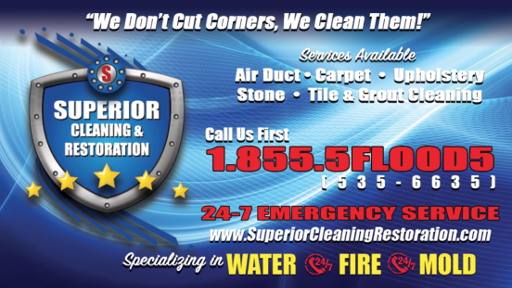 We vacuum clean the ducts with a Duct cleaning system that is truck mounted, very powerful and effective. We are the only company in Southern California with a truck mounted duct cleaning system. This is the #1 recommended system by HVAC duct manufacturers. It not only cleans better than any other system it’s also safer for the ducts and won't tear the lining which decreases air flow and efficiency. Another cause of concern is mold, mildew, fungi and bacteria. Dark and damp, air conditioning ducts are an ideal breeding ground. Since the air ducts are responsible for the heating and the cooling of the house, the aforementioned allergens can actually spread through the house quite rapidly. If your vents are dirty, it will lead to poor ventilation, which in turn will not let fresh air from the outside in making it even easier for respiratory diseases to fester. Though the cleaning of air ducts alone is not a complete solution to respiratory conditions like Asthma it does play quite a vital role in the prevention as well as cure of such health problems. The cleaning of your HVAC system can help remove certain allergens like pollen, mold as well as dust from the ducts, which in turn will minimize further allergens from following. It is recommended by most experts to clean the HVAC system at least on a yearly basis. For all of your air duct cleaning needs Superior Cleaning and Restoration Inc. is here for the fine people of La Jolla, feel free to call us anytime.